You are going to Watch RWBY Volume 2 Episode 12 online free episodes with HQ / high quality. 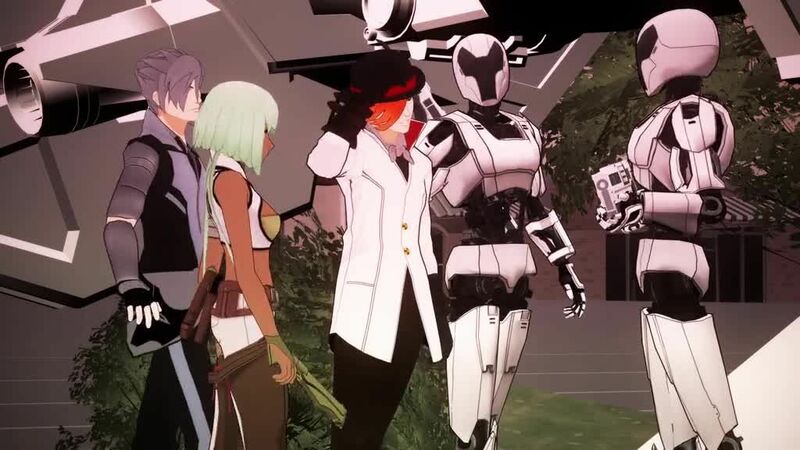 Stream cartoons RWBY Episode 22 Online Team JNPR prepare to go on their mission but are alerted by sirens going off in the city. Team RWBY battles the Grimm and are joined by Team JNPR, Sun and Neptune, Ironwood’s forces, and even Emerald and Mercury. Team CFVY’s members, Coco, Fox, Velvet, and Yatsuhashi, arrive with Professor Port and Glynda to wrap up the battle. In the aftermath, Torchwick is arrested and Glynda seals the underground hole. Ironwood is appointed head of security at the Vytal Festival by the Council of Vale, while Ozpin’s position is called into question. Cinder, Emerald, and Mercury discuss the White Fang’s future co-operation in their plans, only to be joined by Adam Taurus, the organization’s leader, who promises that they will listen to him. In a post-credits scene, Yang encounters the black-haired woman, Raven Branwen, who unmasks herself, revealed to resemble Yang, and comments they have a lot to discuss.